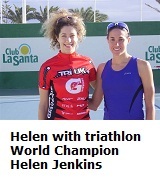 Helen is a multisport athlete, who is enjoying success representing Great Britain as an age grouper. Since competing in her first triathlon in 2006 Helen has been very successful in multi-sport competitions, securing a number of victories and podium places in both, local, national and international triathlons, duathlons, aquathlons and more recently quadrathlons. Helen has won a number of international and national titles and medals including. A high level of commitment has been required for Helen to be able to combine her training and competing with work. Helen has received recognition for her results being runner up two years running in the national 220 Triathlon magazine ‘Female Duathlete of the Year’ award and a former winner of the Wychavon Sporting Hero Award, Hereford and Worcestershire Sports Partnership Female Sports Personality of the Year, Bromsgrove Advertiser Sports Personality of the Year and Bromsgrove District Council Female Sports Personality of the year. Helen was honoured to have been named the 2018 Sporting Hero in the Wychavon Community Recognition Awards. Each year Helen goes to Benidorm in the Costa Blanca region of Spain and this winter she was lucky to be able to return to the resort as a base for a short block of warm weather training. Helen has teamed up with Pulseroll- the leaders in vibration training and recovery. Helen is delighted to have teamed up with Unilite who have become one of her supporters. Pulseroll- the leaders in vibration training and recovery are supporting Helen by providing her with a Vibrating Foam Roller. Helen is pleased to have teamed up with Rivers Fitness who are delighted to sponsor her multi-sport ambitions. Warm weather training is an important part of Helen’s yearly schedule. Established in 1981 as a lighting supplier, Unilite has grown into one of the world’s leading flashlight manufacturers in the global illumination market.